RAPID Scene Control operation using our latest touch screen technology. Our new RAPID Scene Control solution with voice recognition, offers the ultimate in multi-room scene setting, for a wide range of applications. Part of our RAPID Lighting Control System, Scene Control works in conjunction with RAPID dimming lighting control modules (LCMs) and dimming luminaires to achieve advanced scene-setting functionality across individual rooms and multiple floors. 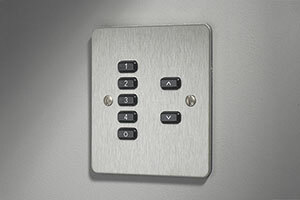 Scene control can be operated using our latest touch screen technology via a tablet or smartphone, and through a range of stylish scene select plates. Clients experience greater flexibility in lighting control by using the new cloud-based apps created by CP Electronics. Operated via Windows 10™ tablets and smartphones*, and available in iOS™ and Android™ on request, end users can instantly control lighting across individual rooms and multiple floors. With the help of tried and trusted voice recognition technology, RAPID Scene Control offers complete, intuitive command of lighting effects, via a tablet device with microphone connection. *Windows 10 offers full functionality. Android and iOS have some limitations.